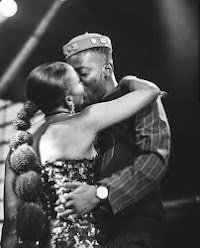 Popular Nigerian singer, Adekunle Gold is celebrating his birthday today, and his lovely wife Simi took to her social media platform to celebrate her hubby . Simi shared a lovely photo from their wedding to celebrate him, she however, disabled comments on the post as she's been under pressure to share more photos from her wedding. Light of my life, I love you. I also like you and the way you do ur tins. I'm such a lucky babe. You're also lucky af, but iss ur beday, so yea, let's focus on the celebrant.